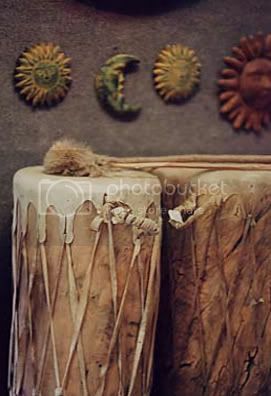 Native American Drums Roger Mathews' Gallery carries a wide assortment of one-of-a-kind gift items. These include handthrown contemporary pottery; unusual framed bas relief sculptures, some in terra cotta, others highly glazed; authentically designed NativeAmerican artifacts such as drums, pipes, feathered weaponry, belts. If you have a specific item in mind, you can describe it to Roger for him to research or design and then create for you. The gallery also carries a limited number of hand sewn and crocheted vests and jackets by a local artisan as well as the midwest's friendliest bears dressed in handmade finery by another local needlework specialist.